Ascension NOW! is thy great plan – the path is laid upon the sand – treasures in our souls unfold – Victory for those so Bold!- Ascension NOW! Ascension NOW! is thy great plan, the path is laid upon the sand, treasures in our souls unfold, Victory for those so bold! Welcome to this Website portal to Asension NOW!. Ascension NOW! is a Movement which is sponsored by the Ascended Masters for the purpose of raising consciousness both individually and collectively. At this time, we broadcast a daily radio show where we give spoken word decrees that can be found on this website by clicking here..
. Ascension NOW! is a plan that Elohim Hercules, Lord Maitreya, Jesus Christ and other Masters (such as Master MORE) are sponsoring and introducing to help the planetary body and all life thereon move to a higher dimension of consciousness. The Age of Aquarius has begun on inner levels, and Ascension NOW! is a sponsored vehicle to help souls of Light Unite and Be Sovereign Beings of Divine Light, here Below All that we are Above. This is a Sacred Mission for those who choose to Be. We’re working with the Ascended Masters for the Ascension of our planet and people to a higher dimension of Being, Light, Peace and Abundance. We Ascend within ourselves. We’re here to BE fully present here and NOW! This Website can help you find the tools, community and Ascension Team so that together – we help Light up the world! This Website is new so your looking at the humble beginnings and we would love to grow with you. You may be inspired to sign up for our newsletter list (we haven’t started our newsletter yet, but hope to soon), where we’ll be sending high frequency messages of Light and inspiration. 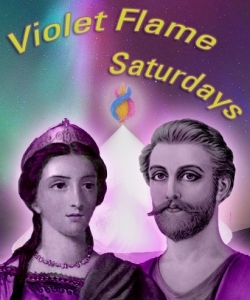 We have a DAILYradio show that you can participate or listen in on called “Violet Flame Saturday’s“. This is a powerful two hour show that includes spoken word exercises, song and blessings for all who join. Please follow your highest inspiration within and join us in the Earth’s and each of our Ascension NOW! The time is here NOW! for the awakening of humanity to our Divine Selves, our I AM Presence. Ascension NOW! is a movement that is sponsored by the Ascended Masters to help you Awaken as your Most Pure Divine Self here in embodiment today! As we work through the seperation consciousness, we move into Being in the Reality that Life is One. In our Oneness, we uncover our unique Divine Individuality. Together we form the Body of God Below as the Body of God is Above. Divine Light. Being the Christ. Loving ourselves as the Most Beloved. Seeing ourselves as the Most Beloved. Being the Most Beloved. Now is our time to Shine! No more holding back the Light. Time to Be Light. Together we take the next step forwards and upwards in our Divine Plans. Follow your Heart and Follow your Presence to your own Ascension NOW! Contact us information including phone and email on Contact Ascension NOW! tab here. DAILY RADIO!!! : DECREES Mon-Thursday Approximately starting at 12:30PM Pacific Time; 6PM Pacific Time Aquarian Age Rosarries and Violet Flame Saturday’s Live every Saturday at 8:30AM Pacific Time. Subscribe to our Ascension mailing list – receive updates from Ascension NOW!